ConceptDraw DIAGRAM is a powerful diagramming and vector drawing software for creating the different types of maps. Continent Maps to design the geographical maps of the world, of any countries and continents, cartograms and thematic maps. Directional Maps to draw directional, location, site, transit and road maps to represent international, business, and professional information visually. Metro Map to create metro maps, route maps, bus, transit maps and other transport schemes. All these solutions provides templates, samples and the large quantity of vector objects to help you draw visual and clear maps simply and quickly. 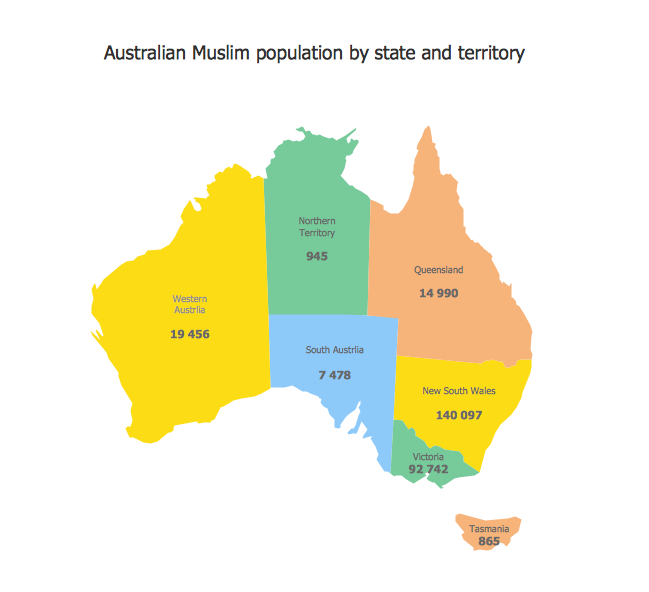 This example was created using the Continent Maps Solution from the Maps area of ConceptDraw Solution Park and shows the distribution of the Muslim population by state and territory in Australia. All maps produced with ConceptDraw DIAGRAM are vector graphic documents and are available for reviewing, modifying, and converting to a variety of formats (image, HTML, PDF file, MS PowerPoint Presentation, Adobe Flash or MS Visio). ConceptDraw DIAGRAM v12 software enhanced with Metro Map Solution from the Maps Area of ConceptDraw Solution Park provides extensive drawing tools for fast and easy creating various metro maps, route maps, transport schemes, metro path maps, subway train maps, and many other types of maps. An Example world map, showing a simple outline of world map. The world map is vector and can be edited or export to svg format.